Following an initial flushing programme in February 2007, when we flushed a young Grahams Amy to Pacha 08 and Grahams Poncho producing 3 embryos, (all of which resulted in calves) we embarked on a comprehensive programme in 2008 where we flushed Middledale Urge twice, Sherry Uricka twice and Grahams Amy once more. Some of the embryos have been implanted (calved from Feb 2009) into home-bred health tested pedigree and pure Limousin recipient heifers, the remainder are frozen for future use. Some pedigree lines within the herd are retained for producing recipient heifers for their fertility and health background. The reasons behind our decision to embark on an ET programme is that we want to spread our very best lines that we have invested in throughout the herd, as quickly as possible and that we are conscious of bringing disease onto the farm from continuously purchasing females. We have no circulating disease and therefore have decided against buying recipients to implant embryos into and use our health tested heifers instead to maintain our status. 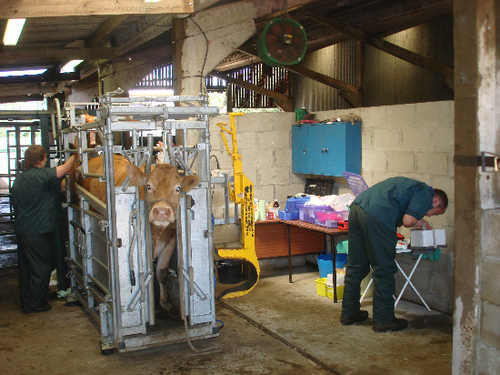 The flushing programme is carried out on-farm by our own vets (Vermuyden Vets, Goole) and Bishopton Vets, Ripon who carry out the flush itself. We feel the ET programme is essential to achieving our targets for the herd, the first three ET calves were born late November 2007 with the only male from that flush selling at the February bull sale 2009 for 4,500gns. We shall continue to use ET in future years to make progress. See our 2009 Embryo calves!